That Meepit was rather misinformed. 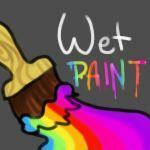 If you get a Fountain Faerie Quest (FFQ), but aren't ready to paint your Neopet, purchase the item and give it to the faerie to complete your quest. 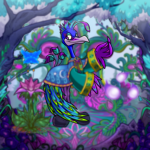 This frees you up for new faerie quests, and the Fountain Faerie will be there waiting for you when you decide what colour to paint your Neopet. If you are an amazingly lucky Neopian and get another FFQ during this time, DON'T turn it in until you've used up the reward from your previous Fountain Faerie Quest. You can have a completed FFQ and an incomplete FFQ, but completed quests don't stack. If you turn in the second, you'll lose the unused first. As for the Illusen and Jhudora quests, they only affect each other. They are separate from the Random Event style faerie quests. Sure! It's now set up so that clicking the image will once again refresh the page. While not "retired," the avatar should not be awarded to anyone that didn't participate in the old Battledome. This bug has now been fixed. If a lot of people on the boards all decide to join one team, that's perfectly within the rules. However, even if that possibly results in the majority joining a certain faction, a larger team size doesn't guarantee a win. Much like the Altador Cup, it isn't the size of the team that matters, but the effort they put forth. For example, if everyone just joins a massive team trying to "guarantee" a win, but then puts no effort into it because they think they'll coast along to a new avatar because of the number of people, then don't be surprised when that team loses. Then we ran away, because angry programmers are scary. get inspiration for the Angry Yurble. The Royal Astronomer trophy is from the Altador Plot, which is a bit different from previous plots as it can still be completed to this day. It has quite a few steps to it, but if you finish it, you will be rewarded with a trophy and access to a daily thatweshouldreallyupdatetheprizesfor. Nope, nope, and usually about 2-3 hours. The questions we answer depend on who's available to answer them, if we're actually able to answer them, and if any question in particular catches our eye. Our Mystery Pic script that hands out prizes apparently hiccupped and then fell over. Don't worry about it. In this particular instance, keep any Neopoints / items that you were rewarded by accident. ~You get bonus points if your Gallery looks nice and organised when you select "view all items," because that's how we see it! ~Avoid busy / patterned backgrounds. If it makes our eyes twitch as we scroll through, we're less likely to select yours. ~As mentioned above, only have Gallery-specific items displayed. ~Do your best to create a unique Gallery, both item-wise and visually. Your Gallery will need to be pretty impressive if you're using a pre-made layout. Oof. A long time. The initial planning stages began in late 2010/ early 2011. Early planning consists of research, writing documents, wire-framing, designing the UI, prototyping, etc. And that's all before actual production even starts. In January of 2011 (as soon as we knew we were revamping the Battledome), we decided we'd do a war set in Tyrannia. In mid-2012 we began to plan the specifics of the war as we got near the BD's final production stages. *Meepit may be questionably adorable. That Wuzzle just wants a hug! "Hey dude," said everybody's favorite extreme potato counter, the Extreme Potato Counting Wocky. "Grant me my heart's greatest desires!" Victirus glanced up, discarding the book he was reading in a reflex. Walking towards the edge of the cliff, he scanned the surrounding woodland. It was faint from the distance, but he could see it: What looked like a cluster of movement near the north edge of the forest.